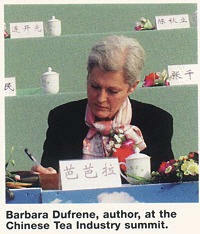 This article is from the Tea & Coffee Trade Journal (June '05). This publication contains many interesting articles on both tea and coffee. It is a great place to learn about tea and the growing regions. The European Tea Committee, founded in 1960, was located in Rotterdam until 1988. It was then moved to Brussels until 1990, then to Paris until June 2004, and is now in Hamburg. The South-West China District: It is the oldest tea growing area of China, producing varieties such as black tea, green tea, tuocha, and Pu’er tea. The South China District: It is the most suitable area for tea tree growing. The South of Yantze River District: It is the principal area of Chinese tea. 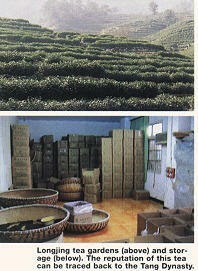 The North of Yangtze River District: The main produce in this location is green tea. Each of the six categories contain many varieties, according to the production area, processing technology and quality criteria. Within these varieties you have several sorting grades. Green tea accounts for over 60% of the Chinese tea production. Its main varieties are fried green tea, with 10 sub-varieties: pan-fried dried and sun-dried; steamed green tea, with two sub varieties and “origin green teas” with 14 authentic origins. Black tea: has the main varieties: Congou black tea, divided into nine main origins, black broken tea, with the standard grades for leaf (FOP, OP, P), broken, etc., and Souchong black tea, divided into Lapsang and Smokey Souchong. Oolong tea: there are about 100 different species for the “Oolong family." Very famous origins are: Tieguan Yin, and most of the “Rock Teas”. White tea: it is only slightly fermented; it is a very special product in China, mainly produced in Fujian Province. It is classified into the following varieties according to the varieties of tea trees and the degrees of maturity of leaves: “Flowery Pekoe” or “Silver needle”, “White Peony”, “Kung Mee” and “Shou-mee”. Yellow tea: is an unfermented tea, produced mainly for domestic consumption, in Anhui and Hubei; the infusion is yellow and has a mellow taste; the best known is probably “Weishan Maojian”. Dark tea: Most of the dark teas are compressed teas, also called Tea Bricks. The most ancient way of making tea is by compressing it in moulds. Dark compressed tea has eight sub varieties, green compressed tea has five sub varieties of which Pu’er cubic packs and Tuo cha are quite well-known in Europe, and there is black compressed tea. All exporting companies normally use this basic classification. Being in a membership with the WTO has given a major impetus to Chinese exporters -- they are keen to inform others about their products and attract customers from abroad. However, communication remains a real problem and the political structures create considerable red tape. Many companies remain state-owned. There is great awareness of the usefulness to be ISO 9001 certified, to have HACCP registration, Organic Certification and -- whenever justified -- a Protected Origin Certification. This Protected Origin Certification is subject to three very stringent requirements: a specific delimited geographical area, a botanical species that has been grown and identified for at least 100 years, and a specific traditional processing method established for at least 100 years. In December 2002, the UN Development Program Office in Beijing provided funds for setting up the first Chinese Tea Industry International Cooperation Summit in Anxi County, Fujian. Three “waiguo-ren” were invited: the head of the FAO Intergovernmental Group for Tea, Kaison Chang, the director of the International Tea Committee, Manuja Peiris and me, the secretary general of the European Tea Committee, since 1991. It was a colorful three-day event, starting on a Sunday, which is the Chinese lucky day. Feng Cheng, the seat of the Country Government is situated in a large, round river bend also known as the “Hometown of Oolong Tea” and “Seed Bed of Tieguan Yin." The “tea capital,” i.e. China’s largest “domestic wholesale market for Oolong tea," with the largest transaction volume in general, is located in a huge building with many tea shops in the surrounding arcades, and spacious conference and ceremony facilities. The river lane leading there is illuminated with tea leaves, and the teapots alight the concrete borders. A beautiful tea museum and many tea bush sculptures surround one of the nearest hilltops bordering the city. There tea is omnipresent and the only available drink. As foreign visitors we were not shown the factories and the gardens, instead we saw the “tea ancestors” and the ancestor of Tieguan Yin, which is a beautiful bush on a hilltop, fenced in with a marble gate and reported to be 800 years old. We met some of the tea garden owners and shared their gifts and samples -- all hand rolled -- back home with some very appreciative tea lovers and tea traders. These samples are generally presented in lovely gift packs, often vacuum packed 8g-12g foil pouches in very attractive boxes. Some took us to their homes. They seemed to be economically well off. None speak English, but they are proud to tell you that now that they have become wealthy their children will get a good education and they will be able to talk to us in a few years. Concerning the current production structure, there are several dozen small companies, farmers who deliver their picking directly to the wholesale market and a hand full of medium size companies. The market is not yet fully standardised. The local premium variety, “Tieguan Yin” contributes about 20% to the output, although some people buy “Benshan” for the same price. Remember that there are more than a 100 different species of Oolong tea. Planted about 15 years ago on a rolling hill top area, 800m above sea level, this organic production area contains more than 12 species. The garden covers an area of 80 hectares, including 40 hectares of tea plantation, among which there are some tea plants over 100 years old. The tea factory, built in 1958 as a national factory, was bought into private ownership in 1999. They pick twice a year: in April and after the summer. The total output is five tons per year. Attached to the tea garden is a holiday resort with luxuriously equipped bungalows that look down into the valley, a swimming pool, a little “toy train” to explore the tea garden surroundings leisurely and -- last but not least -- a top quality restaurant with exquisite cooking that uses fresh local produce and many tea recipes. Yunding Tea Garden is located in the west of Fujian province, and is very convenient for visiting the Yongding Hakka Tulou (Earth buildings), whose history dates back to the Tang Dynasty (A.D. 618-907). Green tea accounts for about 60% of the Chinese production. There are 14 famous “origin teas” amongst them, including “Longjing.” The production area covers over 60 villages and the reputation of this tea can be traced to the Tang Dynasty (618-907). We visited the “Gong” (Tribute) Company with main share holder and general manager QI Guowei, who started working as a tea garden laborer at age seven. Mr. QI runs his company with great skill. XiHu Longjing was the first in China to obtain a certificate of origin for protecting its reputation and authenticity, and has already opened six exclusive shops where only its brand is for sale. The mild and moist climate, favorable soil and ecological surroundings allow for more than four annual pickings, with the best tea plucked before April named “Before Pure Brightness.” This is followed by “Before Grain Rain” (around the 21st of April). High quality Longjing is processed exclusively by hand and according to 10 different frying methods, which are chosen in line with the tea bud qualities of each batch. Approximately 26,000 to 40,000 “buds with two leaves” are needed to produce 500g of Longjing tea. They remain flat and straight in the cup. A dosage of about 3g per glass allows for several infusions -- with water not more than 90° -- of a intensely fragrant, smooth and delicately green beverage. Mr. QI’s tea factory is close to his warehouse, with a capacity of 25.000 kgs, all stored in air-conditioned cubicles. This allows the keeping of the tea for more than two years. The tea is so famous that the Beijing government regularly purchases great amounts of it, which are used for giving gifts to state visitors. 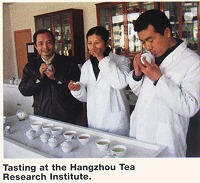 This centrally located institute is in charge of tea quality supervision for the whole PRC. They not only check the product quality and authenticity, but they also have HACCP and ISO certification and test for pesticides and other contaminants. The staff is trained in agricultural science by several universities that deliver BS, MS and PhD degrees for this profession, amongst them is Zhejiang University in Hangzhou. 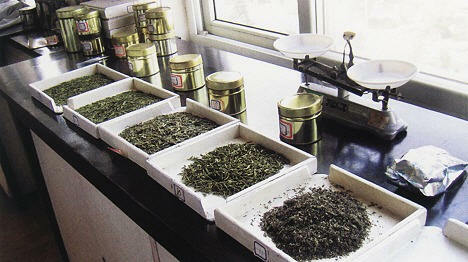 Furthermore, the institute is in charge of the professional training of the personnel of the tea companies. The constant competitions (several every year in all the tea producing areas), which result in winning medals along with nominations to “Tea King” and “Tea Master,” generates a constant assessment and ranking of the product qualities. This enhances the good quality practices of growing, processing, packing, and selling of companies’ many different kinds of teas. Each of the six categories (green, black, oolong, white, yellow and dark tea) has a precise protocol for quantity of leaf, cup size, water temperature and infusion time. The dry leaves undergo scrutiny for visual aspect, smell, color, and taste -- as the made tea, the spent tea, and taken into account, the smell remaining on the lid, on the spoon and in the cup. It is impressive to watch, and very instructive to perform under the trainers’ guidance. Although the team is constantly busy checking produce and teaching company staff, such courses can also be arranged for foreigners. I was told that many Japanese and Americans have been allowed to train with them. Upon my query, they explained that the first step was to assess the pupil's level of knowledge and competence. Afterwards, the duration of the training is agreed accordingly. The institute delivers certificates at the end of the training. The number of premium grade origin products is unbelievable - they say it is over 700.